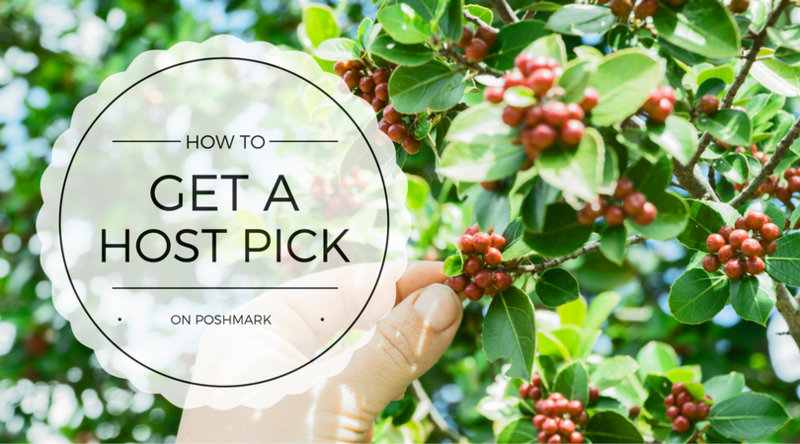 How do I get a host pick on Poshmark? Ah, the coveted host pick. On Poshmark, this is one of the wins that can totally make your day. What is a host pick? During the afternoon and evening parties, assigned party hosts curate the listings in the Host Pick showroom. Those listings can come from any closet that follows Poshmark rules. A host can share a few listings from their own closet, but the main idea is for them to share listings from other users. Some hosts spend several days before a party planning their host picks and some just share from the main party feed as it starts filling up. A lot of hosts combine both approaches and do a little of each. Why do I even want to get host picks? Each host is allowed to share up to 100 listings to the party. So when you look at the number of listings between the Main showroom (hundreds of thousands) and the Host Pick showroom (a few hundred), there’s a massive difference! It’s much easier to browse through the Host Pick showroom because there are fewer listings and they are more likely to have good listing photos and be relevant to the actual theme. Basically, your listing gets a whole lot more exposure. More eyes on it = more chances to make a sale. There are also usually a couple of poshers at each party who will go through and congratulate each and every host pick. So you end up with lots of comments and it makes your listing look more desirable to buyers who come along later. And the Host Pick feed stays accessible well after the party ends, so poshers can browse through the feeds later on. So how do you get someone to give you a host pick? There are a whole lot of tactics for getting host picks, some of them being more or less obnoxious. What works for one host may or may not work on another host, so don’t stress out about getting host picks too much. You can sometimes attract the attention of someone who is about to host a party by sharing a lot of listing from their closet. I’m mean like A LOT of listings. There will probably be a lot of other poshers with the same idea and they will also be sharing that closet. So depending on how close it is to that host’s party, you may need to really go all out to get their attention. If the host has made a party announcement, you can comment on that after sharing their closet. You can congratulate the host and then straight up ask them to take a look at your closet. Or you can tag some other closets to show how nice you are by suggesting closets other than your own. When I have hosted, I will pick a couple of those poshers who are suggesting other closets and give them a host pick as well. Another thing that you can do is tag the host’s closet name in a listing that you think fits the party theme well. I actually didn’t have gazillions of people doing that either time that I hosted, so it stood out. And it was easier to look at a single listing than to browse someone’s entire closet for a host pick. Finally, make sure you participate in the evening parties and share to the feed. Many hosts will save some (or a lot!) of their allotment for on-the-spot host picks. Is it reeeally worth it? To be 100% honest, I don’t really try to get host picks very often. It’s definitely a lot of fun to get a surge of likes and comments, but I haven’t found that it directly results in more sales. So to me, it’s not worth my time to pursue host picks. I see them as a nice surprise when they happen. I’ve even overheard that the idea of host picks was introduced to encourage users to be more active in the app. We like the element of “winning” or feeling special and so many of us will go after that. And the more people are on the app, the more likely they will find something to buy. And that’s how Poshmark makes money! Do you actively try to get host picks? Or is it a big surprise when they come along? Drop a comment below! Great post & info. I just joined within the last week & had a host pick from a closet I hadn’t seen yet – it felt great to know something I love others do to. I agree, the surprise makes it best. Yeah, I dont see the point. I notice that HP items don’t seem to sell any better than non-HP items. I see lots of “congratulations” messages–which frankly seem kind of desperate but not a lot of questions from potential buyers. Does this fit with your take? Yeah, that’s pretty much the case. The owner of Poshmark has even admitted at local meetups before that features like that are geared towards the psychology of women. Trying to get a host pick (which helps people feel validated) encourages them to be more interactive in the app. The more active users are, the more likely they are to buy stuff that they see in the feeds. But I have never seen it help my own sales and that seems to be what most other people say too after getting host picks. I don’t even bother trying for them anymore. I was given the coveted host pick honor last night. It has gotten my closet a lot of attention, so far no sales , but there has been such an outpouring of sharing that I have been busy trying to reciprocate with sharing back.